We have just enough snow at a few higher elevation locations in the Wasatch to make some turns, and I couldn’t be more delighted. Throughout the years, my relationship with skiing and the mountain has evolved and grown. I am always looking for a new challenge, and I want to keep learning. I like to let the mountains speak to me and follow what sets a spark in my heart. 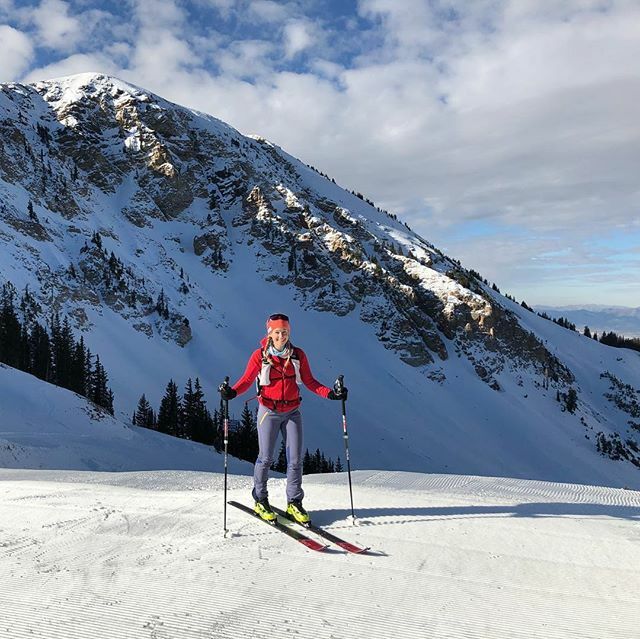 Going from being a weekend warrior to a dedicated resort and powder skier, to a backcountry skier to a ski mountaineer isn’t something that happened overnight. It’s taken me many years (I’m older than I look) of patience and growth!As I’ve delved deeper into the world of ski mountaineering, I've become more fascinated with skimo racing. It's a small niche of the sport where you go up and down the mountain as quickly as possible. It's funny to me that this is something I would be excited about because I do not come from a competitive background in any sport. But it's so fun and exhilarating! And I love the community of people! And there's something about the mindless repetition of training that is therapeutic and healing. Going up and down the mountain over and over, by myself or with others gives me time to process emotions. It appeases my inner perfectionist, and I aim for efficiency with every step, transition and turn. I don't know exactly where this journey will take me this season, but sometimes, it's ok to not know and keep going in the direction of what makes your heart sing. @lekiusa @movementskis @julboeyewearna Photos from a 9k Saturday training.day with @dr.hoffbank @jenhudak and many others.